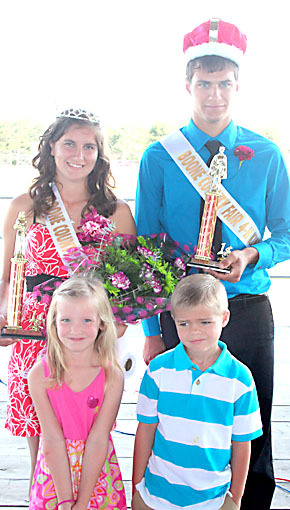 Evey Choat and Ethan Wilke were crowned the 2014 4-H Queen and King at the Boone County Fair last Sunday, July 13. Their crown bearers were (front) Kate Maricle and Jay Rasmussen. Attendants were Lily Johnson, Lauren Wilke, Fina Choat and Lyndsey Figgner; Luke Johnson and Dalton Wagner.